Too many bowhunters stay home during October because the reputation of the “October Lull” has them discouraged. Here’s how to improve your success during each week of this maligned month. In the past, I never really got serious about my deer hunting until the rut. I’m definitely not alone in that regard, many bowhunters ignore the opportunities the month has to offer. Certainly, it’s not like September when the bucks are visible and on predictable daily routines, or November, when the bucks are running around in a testosterone-induced stupor. But October has some advantages, although each week brings new challenges and opportunities. The thing I like most about the first week in October is the opportunity to hunt in pleasant conditions without mosquitoes. The early frosts have eliminated the pests and turned the woods colorful and it’s a great time to be outdoors. The deer hunting locations for me mainly revolves around food in the evening and bedding in the morning. The movements have some regularity to them and with the help of scouting cameras and observation; you can find a buck to target. Another advantage to this time is the solitude. Since most bowhunters are waiting for the rut, you can have the woods to yourself. It’s a great time to hunt the public land that will be full of hunters in November but will have few fresh boot prints in October. These advantages carry over into the second week, as well, but you can add food into the mix. Crops are being harvested and cut cornfields become magnets for the first week or so after they are harvested. Deer move into these fields because the acorns are getting cleaned up and the readily-available missed corn is easy pickings. Ears of high-carbohydrate lie on the ground in plain sight and deer migrate to these areas en-masse. As the weather gets colder, bedding areas become more predictable. 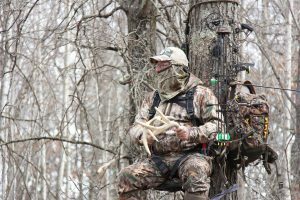 Overcast, windy or rainy weather sends the bucks into the thickets where they have some protection from the elements. Savvy hunters who know where these areas of thermal bedding cover are found can take advantage of the deer as they move out of the cover in the evening to feed, or back to the cover in the morning. By the third week in October, the effectiveness of calling and rattling is rising. Scrapes and rubs are everywhere, but not being checked often just yet; still, they are excellent places to make some noise. Setting up over early rut sign and rattling can be very effective at this time. The last two weeks of October and the first week of November are the only times when I feel that blind calling is effective enough to be worth trying. By blind calling, I mean making attracting noises without actually seeing a deer to call to. Blind calling with a grunt call and rattling must be done from the right location, however. Avoid areas of open timber where the deer can see long distances. If they can see the area where the sound is coming from but don’t see a deer, they probably won’t come. 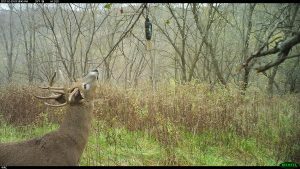 A decoy can help, but better yet, put a barrier of some sort between you and where you expect the deer to be. Even a small rise in terrain that they can’t see over can be enough to make them walk over there to investigate the source of the calling or rattling. The success of calling and rattling continues to grow through the last week in October, but the real area of focus is the sign. Those scrapes that were mostly undisturbed during most of the moth are suddenly getting a lot of activity. 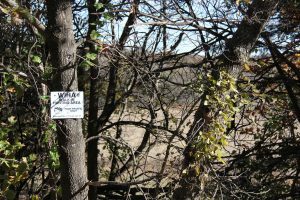 Areas all torn up with scrapes and rubs can be excellent places to park yourself in a treestand for long hours during the end of the month. Here’s a key tip, get downwind of the area, particularly if those scrapes are found along the edge of a field. Bucks avoid exposing themselves to open areas during the daylight and they are unlikely to walk right up to a scrape along the edge of a field unless something really attractive hits their nose. They will often work those scrapes from 30-40 yards downwind, from the cover whenever possible for them to do so. Keep this in mind when you choose the right tree for your stand. 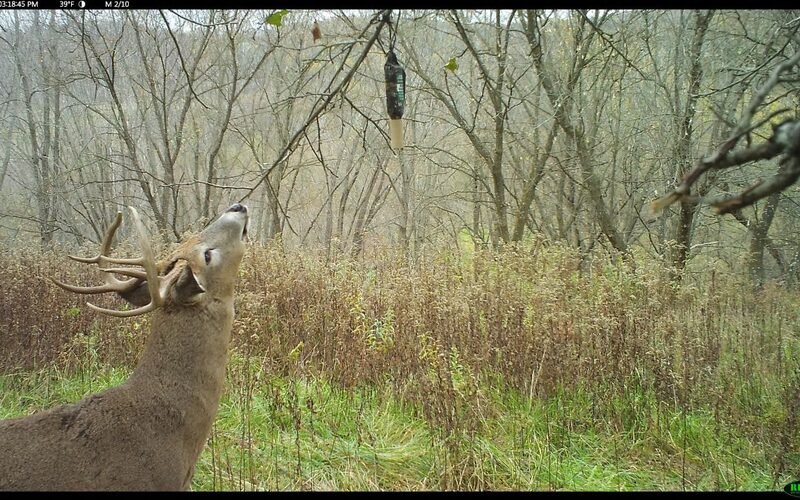 The final week of October offers the best chance of the entire month to attract a buck with a good deer lure. I have had excellent success using a scrape dripper with some Special Golden Estrus or Active Scrape to keep fresh scent going into the scrape during daylight hours. Warm daytime weather causes the dripper to expand, making it drip scent into the scrape. Cool weather at night causes the scent to contract, pulling air back into the container where it stays until it warms up. The advantages of having fresh scent applied only during daylight are obvious. So don’t give up on the maligned month of October. 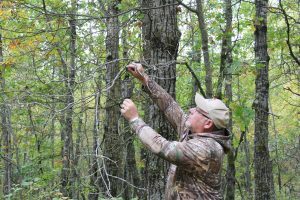 Sure this time period has some challenges, but if you focus on the advantages, you can be wrapping a tag around a buck before most hunters are getting serious about their hunting.